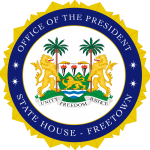 State House, Freetown, Tuesday 26 February 2019 – His Excellency President Julius Maada Bio has hosted the inaugural Presidential Development Partnership Committee, DEPAC, with development partners at a well-attended event at State House. In his statement, President Bio said that he was thankful to the Minister of Planning and Economic Development, the Minister of Finance, development partners and all the other equally valuable stakeholders whose inputs had contributed to the development of the first-ever comprehensive National Development Plan. He said development, to his mind, should be predicated on purposeful planning with development priorities with sectors clearly delineated, development pathways clearly mapped out and intended development outcomes anticipated in an informed way. “The development plan is a shared vision that sharpens focus on strategic goals and facilitates strategic partnerships and collaboration among development partners, MDAs, experts, and policymakers. It also promotes dialogue among all parties and helps all parties avoid possible overlaps of work and waste of resources in sectors or across sectors. “The Medium Term National Development plan is a product of what I have emphasised and insisted on governance – inclusive and purposeful planning for quality service delivery. This plan will help us coordinate all available resources. Our future annual budgets will be fully aligned to this development plan,” he said. President Bio noted that his government was wholeheartedly and resolutely committed to all the priorities identified, adding that Government would ensure that it did not deviate from the identified priority areas. He mentioned that the priorities identified were complementary and mutually reinforcing while expressing the belief that if implementation was properly coordinated it would create multiplier effects in every sector of the country. “My Government is keen on strengthening the partnership with our development partners and make it work for our people and taxpayers of your respective countries who are providing support to Sierra Leone. We fully subscribe to the principles of mutual transparency and accountability. “To ensure that we adhere to those principles, we must continue regular and structured dialogues with you, our partners. This will only enhance coordination and deepen our partnership with you. We will insist on the comprehensive coordination mechanism contained in the Development Cooperation Framework,’’ he said. United Nations Country Representative, Sunil Saigal, thanked President Bio for laying out the vision for the implementation of the new National Development Plan and for the principles for collaboration and coordination with partners in order to achieve the goals of the plan, adding that as partners they welcomed the move by the President and expressed hope that it would be the start of many constructive meetings with the DEPAC becoming a forum for fruitful engagements and dialogue. World Bank Country Manager, Gayle Martin, said that they acknowledged that the new Government inherited a dire economic situation with deterioration in fiscal position, government leakages and slow implementation of key programmes, noting that these challenges would be daunting for any government. She commended Government for taking important steps to restore macroeconomic stability such as dealing with the fuel subsidy, duty waiver and tax exemptions, and rolling out the single treasury account, saying that those measures had been instrumental in bringing additional revenue from ministries, departments and agencies into the budget and for introducing strong revenue control.